I first saw Ghost back in 2012 on the West End and absolutely fell in love with everything about it. The music, the story, the magic and wonder; it was spectacular to watch and became one of my favourites. I then saw the show on its tour a few years ago with Sarah Harding in the leading role of Molly. Needless to say, I did not enjoy the show, and it’s celebrity casting like this that frustrates me. So when I had the chance to see this amazing show again, with two phenomenal leads – Niall Sheehy and Rebekah Lowings – at my local theatre, I wasn’t going to pass up this opportunity. The show is based on the 1990 film starring Patrick Swayze and Demi Moore and tells the story of a loved up couple, Sam and Molly, who are ready to start their lives together when Sam is murdered in a mugging. Throughout the show, Sam is around as a ghost (cue the title of the show), and has unfinished business on earth, relating to the murder. The real highlight of this show, without a doubt, is the music. A superb soundtrack written by Dave Stewart and Glen Ballard is packed with emotion, passion and is one of my all-time favourite scores. I find that some songs, such as “Focus” and “I Can’t Breathe” don’t fit as well because the rest of the numbers all go together smoothly, but it still a beautiful piece of music. Some songs and harmonies were different from the original West End production and I would be curious to know why. In spite of this change, the most recognisable numbers were still in the show, with a powerful overture to grip you from the start. And a beautiful score would not deliver without a talented cast to give it the credit it deserves. 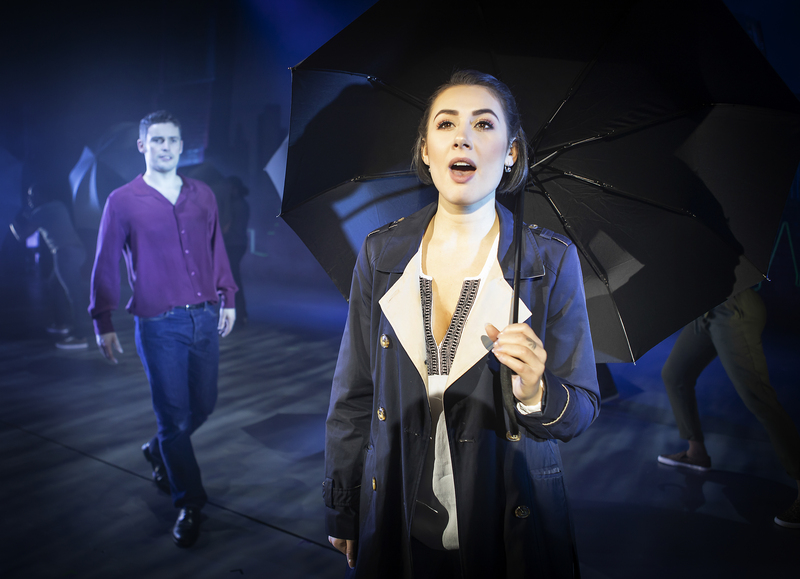 Rebekah Lowings as Molly is the leading talent among her fellow cast mates, with her solo numbers “With You” and “Nothing Stops Another Day” giving me chills and quite literally taking my breath away. She also shines in her duets and trios with Niall Sheehy as Sam and Sergio Pasquariello as Carl. Niall Sheehy makes for a pleasant Sam, with his vocals hitting all the right notes and delivering superbly. Sergio Pasquariello also has a strong voice and his number “Life Turns On A Dime” was enjoyable. However, I did find at times that each of the men were drowned by the ensemble in “More”, though this could have been because of the sound in an old theatre. My issue with Sheehy was perhaps not his fault. I can imagine that Sam is a very difficult role to play because he is a character full of so much emotion: he is angry at his murder, protective of Molly, frustrated that he can’t do anything, urgent to help, and more. All these emotions are incredibly passionate and heightened and would usually involve using both physical and vocal elements to bring such a character to life. However, as a ghost, Sam can’t interact with anyone or anything in his surroundings. This leaves him trying to convey all of these big emotions with just his facial expressions and his vocals, and unfortunately this didn’t convey very well for me. Nevertheless, I still very much enjoyed Niall’s performance as Sam and the interaction he does have, such as that with Oda Mae, was entertaining and well done. Speaking of Oda Mae, Jacqui Dubois is a real star in this production. As the sassy psychic reader, she brings a breath of fresh air and a comedy relief to a show that is inherently sad and emotional. Her two main numbers “Are You A Believer?” and “I’m Outta Here” are nothing less than hilarious and hugely entertaining. Jacqui Dubois is not only funny, however. She does have some heartfelt moments with both Molly and Sam and in order for Ghost to be a successful show, Oda Mae has to be cast by an actress who can deliver. Jacqui Dubois does. As previously mentioned, Sergio Pasquariello made for an enjoyable Carl. The first actor I saw as Carl in 2012 was Andrew Langtee, and he portrayed Carl as a very put-together and powerful character, even during his demise. Pasquariello, however, had Carl more flustered and overwhelmed, and while a great performance, was not so much to my taste. Great vocals and acting don’t let Pasquariello down, however, and he still delivers well. The aforementioned magic and wonder in this show make for real breathtaking moments. 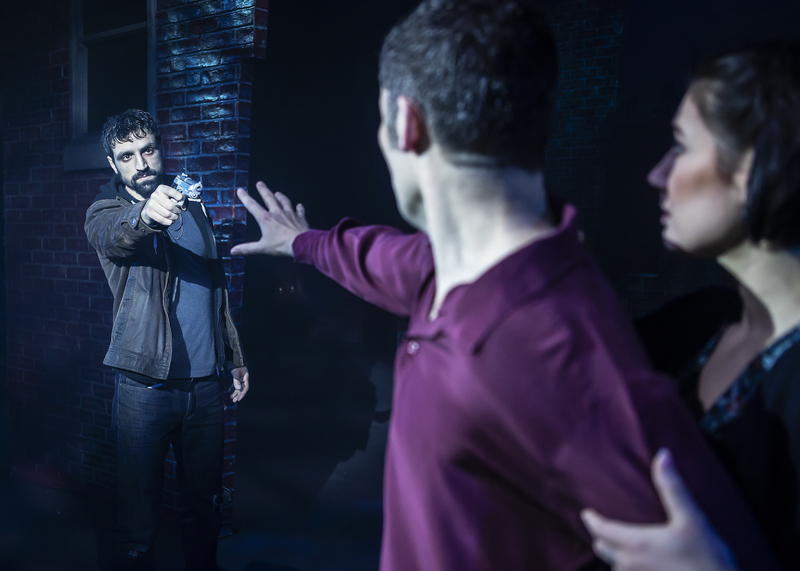 When a gun turns in mid-air, a lamp moves on its own and a newspaper flies across a bench, the audience is captivated. I will never know how things like this are done on stage and would rather remain in the dark and instead be inspired by the magic of theatre. This direction was done well and was wonderful to say the least, but there were some of the elements that brought the show down for me. During “Three Little Words”, a beautiful song between our leading man and woman, the two were moving too much around the stage I felt dizzy watching them. I would have much preferred if they had stayed in one place or moved a little, but it felt like the two of them couldn’t stand still. This constant movement distracted me from the song which was disappointing. A huge issue for me with this production was the time setting. 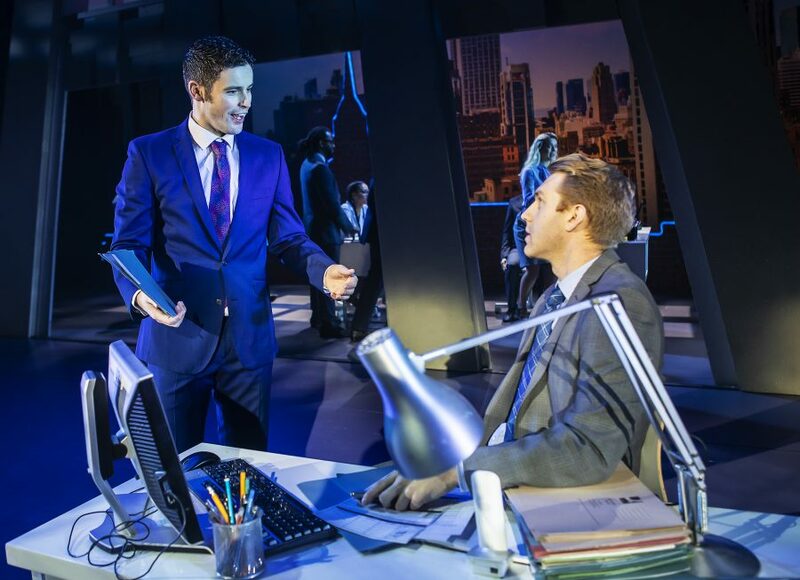 The film was released in 1990 and the majority of the current stage show stays true to that; through double denim, an older-fashioned office desk and dated suits this show screamed the 90s. However, smartphones were also hugely featured in the show, with the song “More” actively using smartphones as part of the choreography, and when Sam and Molly move into their apartment, Carl suggests taking a selfie. This frustrated me immensely and I thought was poor directing. Perhaps setting the story in the current day would make for a new and interesting twist on an older show, but confusing eras was just bad direction. In spite of this, Ghost is still one of my favourite shows and this production was highly enjoyable. 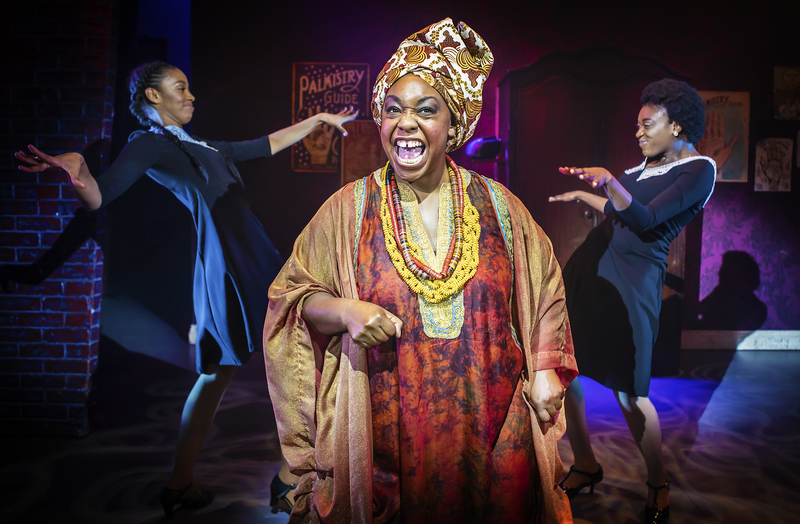 Supported by an incredibly strong ensemble, with standout performances being Jules Brown as Willie Lopez, Charlotte-Kate Warren as Mrs Santiago, Jochebel Ohene MacCarthy as Louise and Sadie-Jean Shirley as Clara. I would recommend seeing this production and I’m glad I did. The UK tour of Ghost continues to Glasgow, Carlisle, Manchester, Liverpool and Bradford. Previous Theatre on the Big Screen – Yes or No?